Aaron Kwok and Shawn Yue are Frenemies? Ending the year off on a bad note, Aaron Kwok (郭富城) was recently labelled as a womanizer. Aside from his infidelity in love, Aaron also reportedly badmouthed friend, Shawn Yue (余文樂). Although they circulate in the same social circles, Aaron spoke poorly of Shawn and called him a city slicker and copycat in a private text message exchange. Shawn Yue and Aaron Kwok: Friends or Foes? A mysterious woman known as Miss R., a 23-year-old student exchange student in Japan, claimed that Aaron cheated in their three-month relationship. After bashing Aaron’s infidelity, Miss R. also revealed Aaron only keeps up a facade in his friendship with Shawn Yue. Often seen partying with Shawn, Aaron surprisingly called the younger artiste a “city slicker” who always copies his style. Miss R: I really hate Shawn Yue. Aaron: Why? Is he your ex[boyfriend]? Miss R: No, when I watch him on TV, I feel like he always follows others. Aaron: Yeah. A city slicker. Miss R: Aren’t you two friends? Miss R: He always copies your style. Aaron: Not only him. Why do people always try to copy me? Aaron Doesn’t Think Shawn is Up to Par? Despite Aaron trash-talking Shawn in his text message, it turns out both singers have a lot in common. Both Aaron and Shawn enjoy pursuing and meeting young pseudo-models online. Shawn was previously romantically linked to model LuLu Wang (王璐瑤) and allegedly sent her suggestive text messages and pictures. Miss R. revealed that Aaron cheated on her with a young model named “M”. Besides “M”, who is speculated to be pseudo-model Milla Ching (程芷渝), Aaron allegedly flirted with a lot other models. Feeling helpless, Aaron released a 1000-word essay claiming that Miss R. had defamed him and said the cheating accusations were all false. 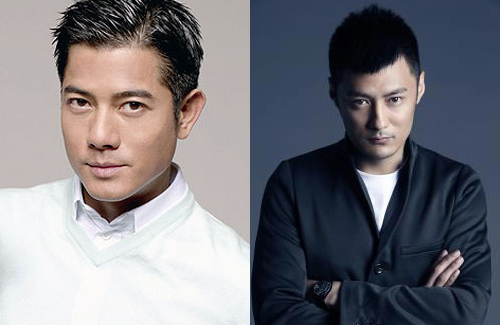 15 comments to Aaron Kwok and Shawn Yue are Frenemies? Aaron seems like a jerk to me if the rumors were true. At least he is not married…so he does nothing wrong (nor hurting anyone) as a player. Well, yeah. Gotta agree with you. At least he is not married. …so its ok to have multiple gfs? I don’t believe he think of those girls as girlfriends more like his playmate. Those girls know that but still willing so don’t feel bad for them at all. Aaron not married and he just having some fun. And the news can be exaggerated or just fake. I agree he is not married. and those models knows well enough Aaron still does not want to settle yet! I’m not keen on believing gossip like this for the most part tbh unless there’s hard evidence. If he did any of this though, then lol. All of the girls are old enough to know what they are getting into. If they are happy to get involved with Aaron, then they must be prepared for the worst. Actually, I am not on a womanizer’s side but I am sure those WOMEN flock themselves knowing he’s loaded right? ahaah…Look at that overrated George Clooney, dated many many young things but never gotten to marrying any of them no matter how hard they try. Finally, this woman came along, who knows if its REAL LOVE OR MONEY only that MRS. will know. Spot on! Nobody criticizes Glooney but lo & behold – a purportedly “cheating” Aaron Kwok & everyone’s ready to lynch him. What is it that people entertain such double-standards with Western stars? ?